Big Brother Gossip: Jerry's Sick...Or Is He? 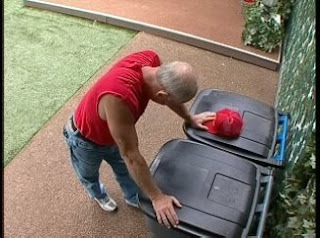 Jerry's been hovering near the garbage cans for quite some time. He gagged a few times, but did he ever really throw up? Dan joked that at the sight of him, Jerry vomits. Maybe the idea of having watched BB for all those years and then coming just 1 person away from winning anything at all in the competition is making him sick to his stomach. I know I'd feel awful! You know, it is 9/11. Maybe it really affects him hard. I know I've been walking around with a queasy feeling in my stomach as a result of the date. I think it's another ploy to make each of them think he is so ill they'll beat him if they take him. same as him complaining for about two weeks that his neck was killing him and yet he wouldn't ask for meds and continued to work out causing it more damage...or was it sore to begin with? he finally was told by production to stop using the rubber bands to exercise with....even they were sick of his whining. OR it could be just his nasty evil ways backing up on him. call me ruthless but I could care less if he is REALLY sick or not.